Alternate Given Name: David. Alternate Spellings of Surname: Bataglia, Battaghlia, Battaglia. Born in Switzerland in 1829, Daniel Battaglia was a 34-year-old barkeeper and resident of Easton, Northampton County, Pennsylvania at the outset of the Civil War. He enrolled for military service at Easton on 15 September 1861, and mustered in for duty the following day as a Private with Company A, 47th Regiment, Pennsylvania Volunteer Infantry at Camp Curtin, Harrisburg, Dauphin County, where he received training in light infantry tactics. He is described in military records as being 5’9” tall with sandy hair, dark eyes and a sallow complexion. The entire regiment was then mustered in to the U.S. Army with great fanfare on 24 September of that same year. 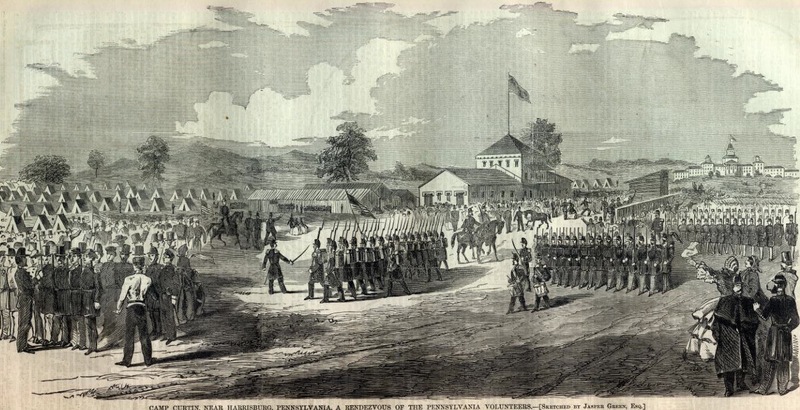 On 27 September, the 47th Pennsylvania was assigned (with the 33rd, 49th and 79th New York regiments) to Brigadier-General Isaac Stevens’ 3rd Brigade. By early afternoon, Daniel Battaglia was marching behind the 47th Pennsylvania’s regimental band (with his Mississippi rifle, supplied by the Keystone State) en route to the eastern side of the Potomac River and Camp Lyon, Maryland, which was situated near a chain bridge. By 5 p.m., the 47th and 46th Pennsylvania Volunteers were sent double-quick across that bridge into Rebel territory. Arriving at Camp Advance about two miles from the Chain Bridge, they made camp at dusk in a deep ravine near Fort Ethan Allen. They had completed a roughly eight-mile trek, were encamped near General W.F. Smith’s headquarters, and were now part of the larger Army of the Potomac, assigned to defend the nation’s capital from the time of their September arrival through late January when the 47th Pennsylvania would be shipped south. As a reward – and in preparation for bigger things to come, Brannan obtained new Springfield rifles for every member of the 47th Pennsylvania. Next ordered to move from their Virginia encampment back to Maryland, the 47th Pennsylvania Volunteers briefly quartered at Annapolis. By December, 101 men were listed on Company A’s roster. Traveling south on the steamer Oriental from 27 January to February 1862, Daniel Battaglia and the men of the 47th sailed to Key West, Florida where they were assigned to protect residents of the area who remained loyal to the Union by garrisoning Fort Taylor. On 14 February, the regiment made its presence known to area residents via a parade through the city’s streets. That weekend, a number of men from the regiment mingled with Key West residents as they attended services at local churches. From mid-June through July, they were attached to the Beaufort District, Department of the South, and operated from Hilton Head, South Carolina. Picket duties were rotated among the Union regiments stationed there, putting Daniel Battaglia and others at risk from sniper fire. The men of the 47th were now equipped with Springfield rifles. On 30 September 1862, the 47th headed back to Florida, where it engaged with other Union troops in capturing Saint John’s Bluff from 1 to 3 October. Led by Brigadier-General John Milton Brannan, the 1,500-plus Union force disembarked from troop carriers with gunboat support at Mayport Mills and Mount Pleasant Creek, Florida. The expedition would take Daniel Battaglia and his fellow 47th Pennsylvanians deeper into Confederate territory than they could have imagined. Assigned to point, the 47th led the brigade through 25 miles of heavily forested swampland teeming with poisonous snakes, alligators, disease-carrying insects and Rebel troops. Skirmishing their way through, the brigade forced the Confederate Army to abandon its artillery battery atop Saint John’s Bluff, and paved the way for the Union to occupy the town of Jacksonville, Florida. From 21-23 October, Daniel Battaglia participated in his regiment’s first major campaign, the Battle of Pocotaligo. Eighteen enlisted men from the 47th were killed; another 114 were wounded. Led by brigade commander, Colonel Tilghman H. Good, and regimental commander, Lieutenant Colonel George W. Alexander, the 47th met heavily fortified Confederate troops in and around Pocotaligo, South Carolina – including at Frampton’s Plantation and the Pocotaligo Bridge. Battered by cannons from a Confederate battery and rifle fire from the surrounding forests, the Union regiments grappled with the Confederates where they found them, pursuing enemy troops for four miles as they retreated to the bridge where the 47th then relieved the 7th Connecticut. But the Confederates were just too well fortified. After two hours of intense fighting in an unsuccessful attempt to take the ravine and bridge, sorely depleted ammunition supplies forced the 47th’s withdrawal to Mackey’s Point. Losses for the 47th Pennsylvania were significant. Captain Charles Mickley was killed and Captain George Junker mortally wounded. Captain Reuben Gardner and Lieutenant William Geety were wounded, but survived. The 47th Pennsylvania returned to Hilton Head on 23 October, where members of the regiment served as the funeral Honor Guard for the commander of the U.S. Army’s 10th Corps and Department of the South, General Ormsby McKnight Mitchel, who died from yellow fever on 30 October. The Mountains of Mitchel, a region of the South Pole on Mars discovered by Mitchel in 1846 while working as an astronomer at the University of Cincinnati, and Mitchelville, the first Freedmen’s town created after the Civil War, were both later named for him. The men of the 47th Pennsylvania were the soldiers given the high honor of firing the salute over his grave. While at Fort Taylor from March through December of 1863, men from the 47th were assigned to fell trees and build roads while continuing to strengthening the facility’s fortifications. In addition, they were also sent out on skirmishes. In early January 1864, the 47th was ordered to expand the reach of the Union Army. Captain Graeffe, Company A’s commanding officer, and a group of men were assigned to special duty which involved raids on area cattle herds in order to provide food for the growing Union troop presence, taking them as far north as Fort Myers. 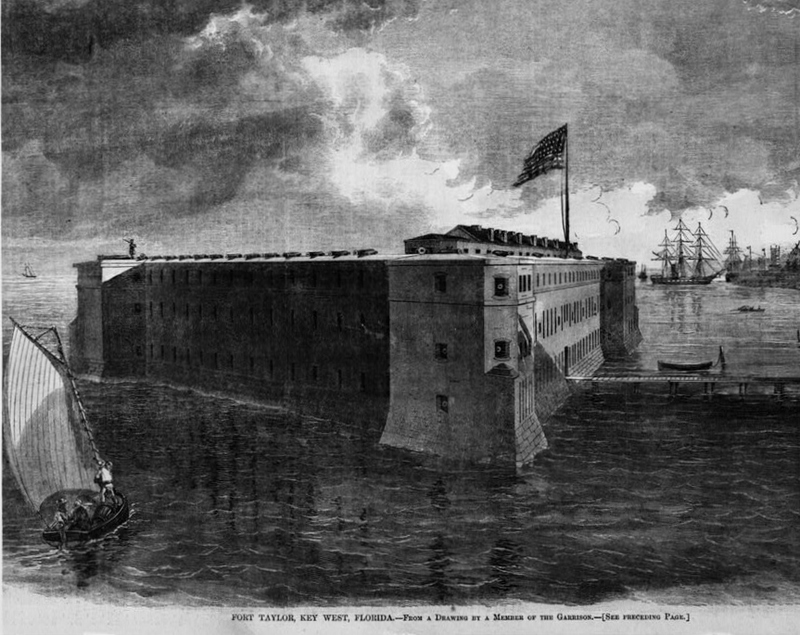 Abandoned in 1858 after the U.S. government’s third war with the Seminole Indians, the fort was ordered to be reclaimed and revitalized by General D. P. Woodbury, Commanding Officer, U.S. Department of the Gulf, District of Key West and the Tortugas in 1864 to facilitate the Union’s Gulf Coast blockade while also offering shelter for pro-Union supporters and those fleeing Rebel troops, including Confederate Army deserters and escaped slaves. 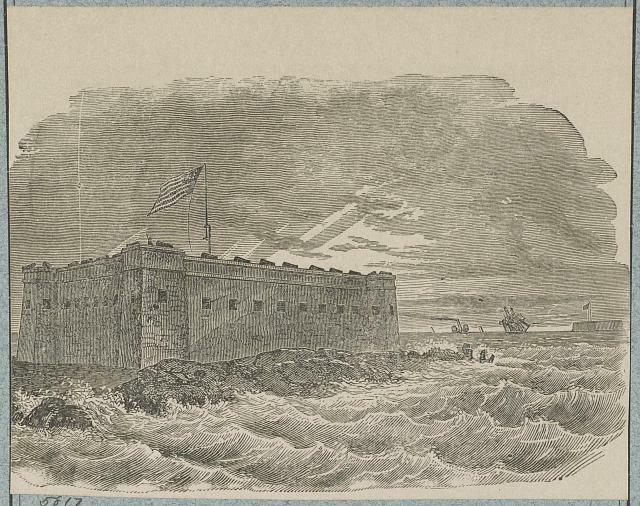 A small contingent of 20 men and two officers from the Pennsylvania 47th Regiment, led by Captain Henry Crain of the 2nd Regiment of Florida, arrived at the fort on January 7, 1864. A short time later, the party was joined by another small detachment of the 47th under the command of Captain Richard A. Graeffe. Over a short period, increasing reinforcements of the fort led to increasing cattle raids throughout the region. A Union force so far into Confederate land did not go well with Confederate loyalists. The fact that so many men stationed at the post were black soldiers from the newly created U.S. Colored Troops was particularly aggravating. The raids were so antagonizing that the Confederates created a Cattle Guard Battalion called the “Cow Cavalry” to repulse Union raiders. The unit remained a primary threat to the Union soldiers carrying out raids and reconnaissance missions from Brooksville to as far south as Lake Okeechobee and Fort Myers. The detachment which served under Graeffe at Fort Myers has been labeled as the Florida Rangers in several publications, including The War of the Rebellion: A Compilation of the Official Records of the Union and Confederate Armies, prepared by Lieutenant Colonel Robert N. Scott, et. al. (1891). Several of Graeffe’s hand drawn sketches of Fort Myers were published in 2000 in Images of America: Fort Myers by Gregg Tuner and Stan Mulford. As the final days of Winter ebbed in 1864, Daniel Battaglia was, unknowingly, about to make history with his regiment. Departing their Florida headquarters on 25 February, the 47th Pennsylvania Volunteers would become the only Pennsylvania regiment to serve in the Red River Campaign mounted by Union General Nathaniel P. Banks from 10 March to 22 May. 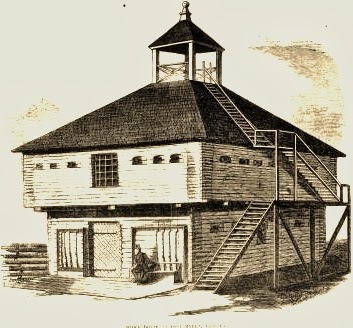 Steaming aboard the Charles Thomas for New Orleans, the men of the 47th arrived at Algiers, Louisiana on 28 February, and were then shipped by train to Brashear City and then the Bayou Teche via the steamer Franklin. There, the 47th Pennsylvania Volunteers became part of the 2nd Brigade, 1st Division of the Department of the Gulf’s 19th Army Corps. On the move again from 14-26 March, the 47th Pennsylvania headed for Alexandria, Louisiana. On 8 April, 60 men from the regiment died during the Battle of Sabine Cross Roads. Rushed into battle ahead of other regiments in the 2nd Division, 60 members of the 47th were cut down on 8 April during the back-and-forth volley of fire unleashed by both sides during the battle (also known as the Battle of Mansfield). The fighting waned only when darkness fell. The exhausted, but uninjured collapsed beside the gravely wounded. After midnight, the surviving Union troops withdrew to Pleasant Hill. The next day, still more perished during the fierce fighting during the Battle of Pleasant Hill while others were captured by Rebel forces. Taken to Confederate prison camps, a number of the 47th were released during a prisoner exchange between the armies on 22 July 1864 while others were held until August or November of that year. At least one member of the 47th never made it out alive. 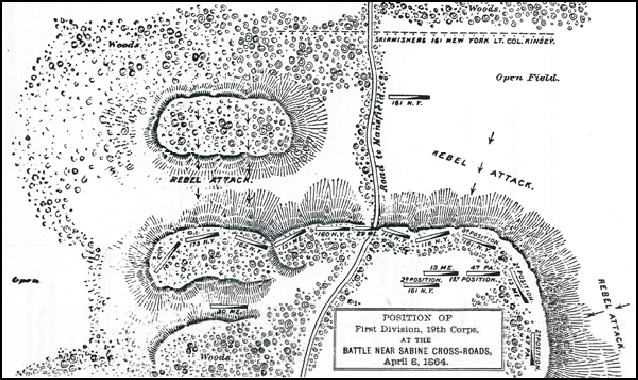 Falling back to Grand Ecore after what was, according to some historians, technically a Union victory or a draw at Pleasant Hill, Daniel Battaglia and his fellow 47th resupplied and regrouped until 22 April. Retreating further to Alexandria, they then scored another victory against the Confederates at Cane Hill. Crossing the Cane River via Monett’s Ferry on 23 April, they were next assigned to build a dam across the Red River from 30 April through 10 May. On 13 May, the 47th was ordered to Morganza and on to New Orleans 20 June. Throughout this difficult campaign and their earlier years in the deep South, a fair number of the 47th who had managed to survive intense combat were lost to another challenging foe – disease. Typhoid, yellow jack and even dysentery claimed men whose immune systems were unprepared for close military camp life and their sudden exposure to a more tropical climate. Returning to the Washington, D.C. area aboard the McClellan beginning 7 July – and still willing and able to fight after his time in Bayou country, Daniel Battaglia and his fellow 47th Pennsylvanians from Companies A, C, D, E, F, H, and I had a memorable encounter with President Abraham Lincoln before following their new orders to join Major-General David Hunter’s forces at Snicker’s Gap, Virginia in mid-July and the Middle Military Division, Army of the Shenandoah (beginning in August). Once again, they helped to defend Washington, D.C. and, this time, drove Rebel forces from Maryland. On September 18 1864, Private Daniel Private Battaglia was Honorably Discharged from the 47th Pennsylvania Volunteers upon expiration of his three-year term of service – but he was not done helping to preserve the Union of his adopted homeland. Lee’s Surrender at Appomattox, Virginia (9 April 1865). Finally, on 9 July 1865, Private Daniel Battaglia honorably mustered out of Civil War service, and returned to civilian life. As the twilight of the 19th century dawned, Daniel Battaglia battled serious mental health issues. Admitted to the U.S. National Home for Disabled Volunteer Soldiers in Hampton, Virginia on 21 January, he was described as having never married and also as suffering from senility. The home’s administrators had been unable to locate an address for the only next of kin listed for him, George Battaglia, but did note that, if Daniel were able to be released at a future date, his residence subsequent to discharge would be Crosswicks in Burlington County, New Jersey. Since this discharge was not possible, his attorney helped him to file for his U.S. Civil War Pension in 1904. His illness worsening, Daniel Battaglia was eventually transferred to St. Elizabeths Hospital in Washington, D.C., where 0n 17 March 1909, he passed away. The Government Hospital for the Insane, renamed by the U.S. Congress as St. Elizabeths (public domain). 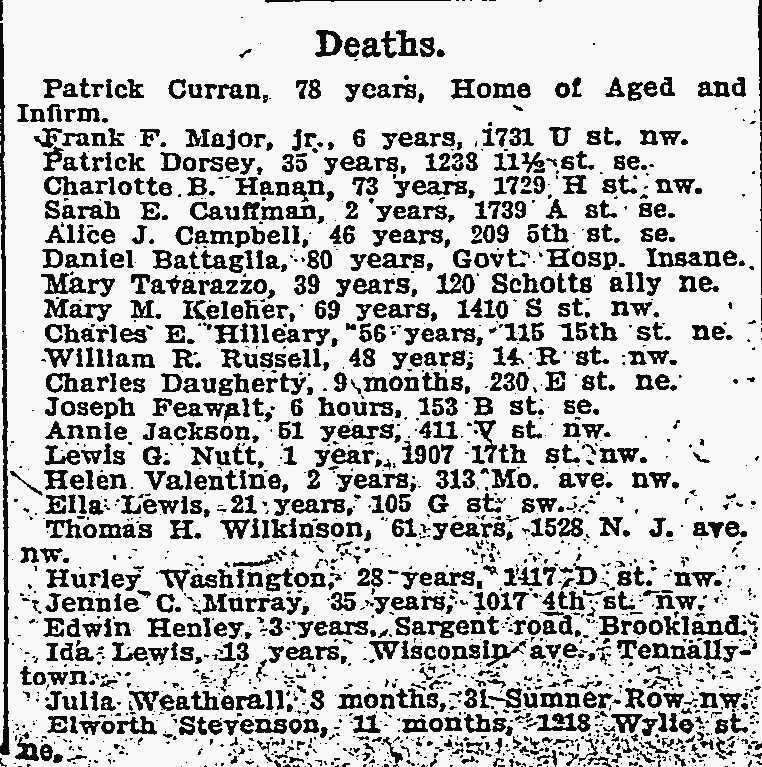 Daniel Battaglia’s death notice, Washington Post, 20 March 1909. Although the newspaper failed to convey the full story of Private Daniel Battaglia, his service to a grateful nation has not been forgotten by his adopted homeland. This emigrant from Switzerland who fought valiantly to preserve America’s Union at great personal cost was given the honor of a hero’s resting spot, and was interred at Arlington National Cemetery. Now at peace with his fellow Union Army comrades, his grave site is visited each year during “Flags In,” when the members of the U.S. Army’s Old Guard place hundreds of thousands of flags on the graves of America’s fallen prior to Memorial Day. When visiting Arlington, Private Daniel Battaglia’s grave may be found in Arlington’s Section 17, Site 17543. Say hello and thank you when you’re in town. 2. Civil War Veterans’ Card File (Daniel Battaghlia). Harrisburg: Pennsylvania State Archives. 3. District of Columbia, Deaths and Burials, 1840-1964. Utah: FamilySearch. 4. Historical Register of National Homes for Disabled Volunteer Soldiers (Daniel Battaglia, Southern Branch Hampton, Virginia, 1895-1909), in U.S. Department of Veterans Affairs Record Group 15 (NARA Microfilm M1749). Washington D.C.: U.S. National Archives and Records Administration. 5. National Cemetery Interment Control Form (Daniel Battaglia), in U.S. Office of the Quartermaster General Record Group 92. College Park: U.S. National Archives. 6. Nationwide Gravesite Locator (online records). Washington, D.C. U.S. National Cemetery Administration and U.S. National Park Service. 7. Record of Officers and Men of New Jersey in the Civil War, 1861-1865, Vol. 1, William S. Stryker, Adjutant General, New Jersey State Archives. 9. U.S. Census. Washington, D.C.: 1900. 10. U.S. Civil War Pension Index (Application No: 1309, Certificate No: 1085454, filed from Pennsylvania by the veteran and his attorney, H. Nachtigall[? ], on 23 February 1904). Washington, D.C.: U.S. National Archives and Records Administration. 11. Deaths, in Washington Post. Washington, D.C.: 20 March 1909.